Snack for a beautiful Saturday afternoon: cheesecake and decaff coffee. On my dogwood tray! I love cheesecake! That's what my mother always brings for my birthday. It's probably the only time of the year I have it b/c I always eat way too much! You are so inspiring to me. You represent so much of the woman I hope to be. I am so disorganized, and there are so many domestic things that I am clueless about. I am a mother of one, and I work full time, and am very happy. Yet, I so long to have more domestic skills and be much more like you. May God continue to bless you. Anna, have you planted a garden this year? Ooohh. Yummy. 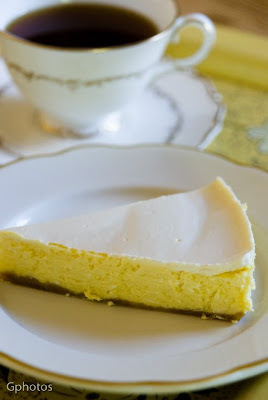 I've been inspired to make a cheesecake this week! I've also come to the conclusion that you could make a mudpie, and as long as your son was photographing it I'd think it to be a work of art. He's certainly a great photographer. That looks like the perfect afternoon tea. Would you share the recipe for your cheesecake? Looks so delicious and not too thick. Just the right size! Now it's time to start sharing the recipe!